1. Only metal roof, walls are not metal, booster will wok well if you can receive 1-2 bar signal outside house. But outdoor antenna on the roof need to more higher, far away from roof at least 1.5 meter/5 ft.
2. Full metal building, good outside signal but no service inside, we am not sure that booster will work. Because a few customers told us that booster boost cell signal inside but can not make call and send text. Therefore, please according to your detail situation to purchase. If you decide to purchase, please to contact us if there is any issues. We will try our best to help you. 1) Booster and indoor antenna need to be installed inside house, outdoor antenna set up on the roof as high as possible . 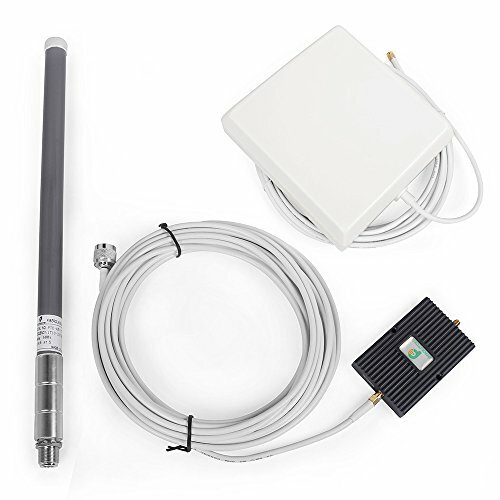 2) Keep indoor antenna and outdoor antenna separately by wall, and far away from each other more than 10 meters. Boost Verizon LTE 4G signal to make call and send txt, no more dropped calls. Coverage up to 2500sqft, good for home or small office etc. Simple and easy to set up, ship by easy-to-open packaging. Installation point: keep indoor and outdoor antenna far away from eachother and not pointed at eachother,to avoid interference. Guarantee: 30 days customers satisfaction, 3 months free replacement,1 year manufacturer warranty.